In Malaysia, the Group operates the SK331 PSC, located onshore Sarawak through its 51%-owned subsidiary RHP (Mukah) Pte Ltd ("RHP (Mukah)"). The remaining 49% equity in RHP (Mukah) is held by Tumbuh Tiasa Enterprises Sdn. Bhd. 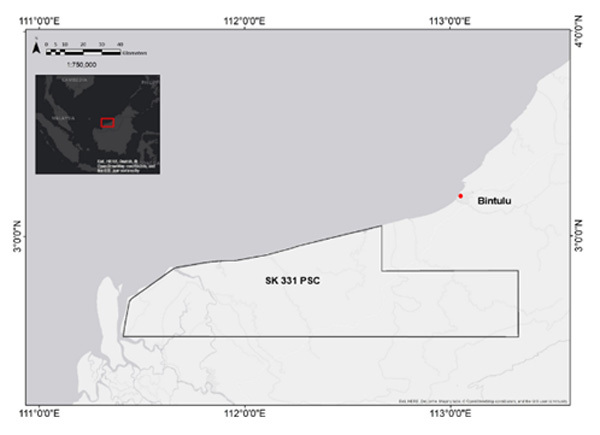 RHP (Mukah) holds an 80% working interest in the SK331 PSC, which gives the Group an effective working interest of 40.8% in the block. Petronas is the other partner in the PSC with a 20% working interest. SK331 block is the onshore extension of the prolific Balingian Basin, where many large oil and gas fields are located in the offshore area. Since the award of the SK331 PSC in December 2012, the Group has carried out a range of exploration activities in the block which include aerogravity/aeromagnetic survey, geochemistry survey, new 2D seismic survey and the reprocessing of existing 2D seismic data. The SK331 PSC is currently in its Third Exploration Period Extension which will expire in December 2019. Following partial relinquishment under this latest extension, the block&apos;s acreage is reduced to approximately 8,963 km2 , and RHP (Mukah) has committed to conduct additional 2D seismic survey. Aside from the above, there is no further outstanding work commitment under the SK331 PSC. The Group is keen to grow its presence in Malaysia and is actively seeking new opportunities in the country. For the latest update on the SK 331 PSC, please refer to our latest corporate presentation. Copyrights © 2012 RH PetroGas. All Rights Reserved. Please read our Terms and Conditions and Disclaimer carefully. No contents can be reproduced without prior written consent of RH Petrogas Limited.